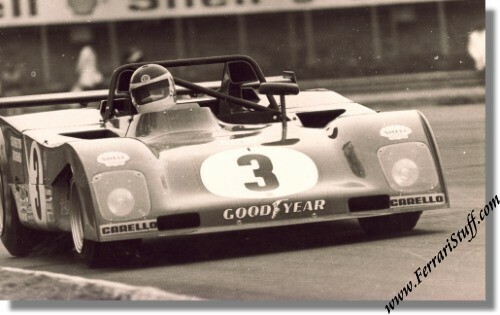 Vintage 1973 Photo of Ferrari 312 P S/N 0894 with Carlos Reutemann and Tim Schenken at the 1000 KM Monza. This is a vintage & original photo of the Ferrari 312P of Carlos Reutemann (driving in this picture) and Tim Schenken, en route to 2nd overall in the 1973 running of the 1000 KM of Monza. The car, S/N 0894, survives to this day and presumably resides in the USA. It measures some 9.5 x 7 inches (24 x 17.5 cm) and is black & white.